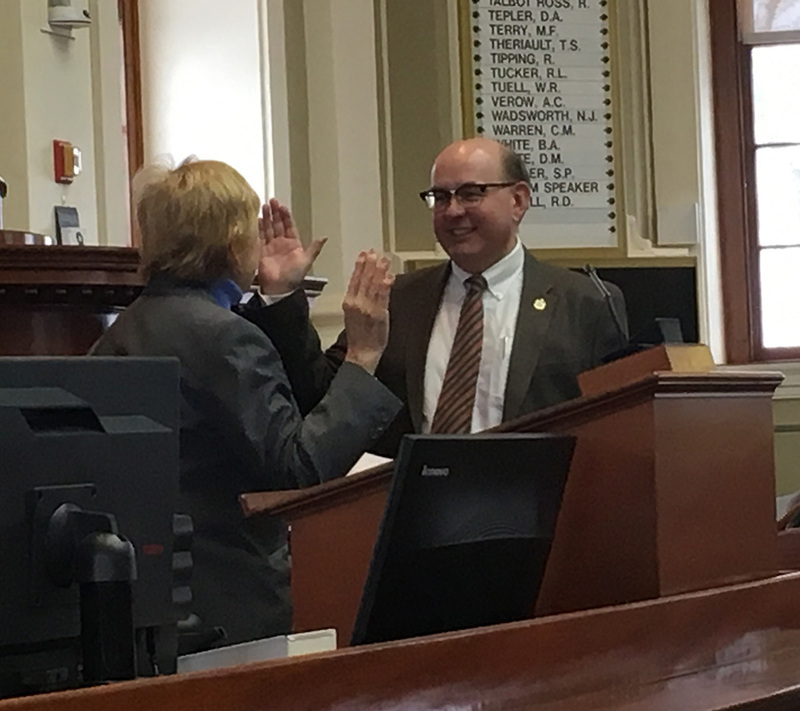 Matthew Dunlap of Old Town was elected by the Legislature to serve as Maine's 47th and 49th Secretary of State. He was sworn in on Jan. 8, 2019 to serve his fourth consecutive and seventh overall term in office. He previously served three terms as Maine's 47th Secretary of State and is the first person to serve non-consecutive terms as Secretary of State since 1880. Secretary Dunlap's widely varied professional career has included extensive work as a cook, a bartender and bar manager, radio show host, proofreader, research assistant, waiter, editor, writer, fur trapper, and textile worker. Secretary Dunlap's career in public service began with his election to the Maine House of Representatives in 1996. During eight years in the Legislature, he served three terms as House Chair of the Joint Standing Committee on Inland Fisheries and Wildlife. He was also Democratic Chair of the 2002 Legislative Apportionment Commission, a member of the House Standing Committee on Elections, served as House Chair of the Citizen's Advisory Commission to Secure the Future of Maine's Wildlife and Fish, and was the first House Chair of the Joint Standing Committee on Program Evaluation and Governmental Accountability. He was also Chair of the Old Town Democratic City Committee. Dunlap's notable legislative activities included securing passage of the Great Ponds Act, the creation of the Maine Online Sportsman's Electronic System (MOSES), sponsorship of the legislation creating the Maine Atlantic Salmon Commission, protections for permanently disabled workers under the State Retirement System, creation and development of the Lifetime Hunting and Fishing License, stabilization of conservation revenue streams, and the creation of the Office of Program Evaluation and Governmental Accountability. While natural resource conservation was the hallmark of Dunlap's legislative career, he also was a vocal champion for historic preservation and promotion of Maine libraries. He sponsored enacted legislation to protect library materials in circulation and to proscribe illegal sale of rare and important public documents. Dunlap has been an active and vigorous promoter of technological improvements in the delivery of government services. In addition to his legislative work developing the MOSES system, as Secretary of State he is a member of the InforME board. As Maine's chief motor vehicle official, he has also continued the work to modernize and integrate the electronic delivery of many services, including Rapid Renewal and online driver's license renewals. In this role he was nominated by Governor John Baldacci and Senator Susan Collins to be a member of the Negotiated Rulemaking Committee to Establish Minimum Standards for State-Issued Driver's Licenses and Identification Cards created under the Intelligence Reform Act. With passage of the Real ID Act, Dunlap has been an active participant in the national discussion of identity security. Dunlap is a founder and vice-president of Maine's Youth Fish and Game Association (maineyouthfishandgame.org), and is president of the University of Maine 'M' Club. He is a monthly columnist for the Northwoods Sporting Journal, and is a member of the Outdoor Writers Association of America and the New England Outdoor Writers Association. He is an assessing editor for the Journal of Mind and Behavior and is a periodic co-host on Maine Outdoors, broadcast statewide each Sunday night by the Clear Channel talk radio network. In 2011, he served as Executive Director of the Sportsman’s Alliance of Maine. He is a former Commissioner on the Maine Wabanaki-State Child Welfare Truth and Reconciliation Commission (February 2013-June 2015) and served as a member of the national Presidential Advisory Commission on Election Integrity, (May 2017- January 2018). He belongs to numerous conservation and civic organizations. He is also a Notary Public and Dedimus Justice. Raised in Bar Harbor, Secretary Dunlap is a graduate of Mount Desert Island High School. He later graduated from the University of Maine, where he was a varsity member of the track and cross-country teams and received a B.A. in History and an M.A. in English. He lives in Old Town with his wife, Representative Michelle Dunphy and their daughter, Emily Charlotte Dunlap. Historical List of Secretaries of State, 1820-present - Provided by the Law and Legislative Reference Library.